The ERSS-36 Studio Speaker Stands from Raxxess are constructed of 3/4" furniture grade hardboard, and finished in a black oak laminate. The speaker platform and base are 12" square, and the bottom is easily removed to allow the 5" center post to be filled with bagged sand to absorb rumble, and other interior low-end aberrations, through acoustical de-coupling. 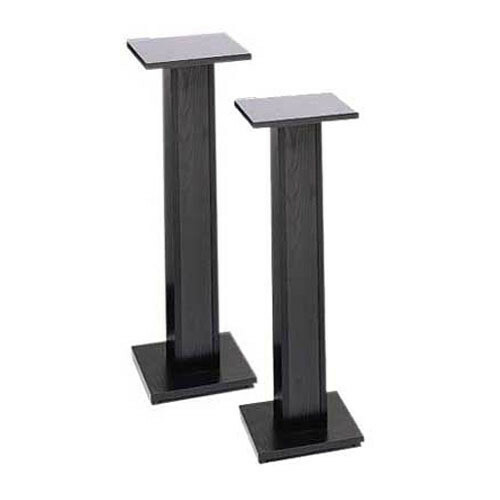 Box Dimensions (LxWxH) 36.0 x 13.0 x 9.0"
ERSS-36 - 36" Economy Speaker Stand - Pair (Black) is rated 4.7 out of 5 by 3. Rated 5 out of 5 by Anonymous from Inexpensive, h. duty,high quality stands I use the Raxxess Economy stands to hold up my 26 lb Yamaha HS80 studio monitors. They are well built, attractive, and get the job done. It is a small hassle to get the wood glue and piece together the bobbins but it takes all of 5-7 minutes and you are done. Mine came with all the parts intact, and nothing missing. The price is right and these stands can hold more than they are rated for if you put the optional sand in the stand columns. I would recommend these to a friend.